Marie Louise Tucek Knox Tompkins, the age of 89, passed away of natural causes on December 7th, 2018, in her home in Canyon, Texas. Services will be 3:00 P.M. Monday, December 10, 2018 at St. Paul Lutheran Church with John Elser, Chaplain of Amarillo VA Hospital, officiating. Burial will follow at Dreamland Cemetery. Louise was survived by her husband R.L. (Tommy) Tompkins of Canyon, her daughter Roxie Wallace and her husband Danny of Norton, NM; her grandson Matt Wallace, his wife Jessica and their son Cash of Canyon; her granddaughter Julie Lafferty, her husband Kalon, and their daughter Addie of Bard, NM. Louise was preceded in death by her first husband Thomas Loys Knox, her father Joseph Tucek, her mother Helena Tucek, her brothers and sisters Annie Beckman, Joe Tucek, Harry Tucek, Mabel McBroom, Raymond Tucek, Ella Leseberg, Katie Reineke, Dora Coale, and Lewis Tucek. 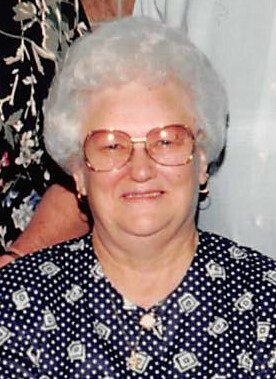 Marie Louise Tompkins, called Louise by her friends and family and fondly called Lolo by her grandchildren and great-grandchildren, was born April 6, 1929 on the family farm West of Canyon, TX. Louise graduated from Canyon High School in May 1946 and in June married Thomas Loys Knox. Louise and Loys farmed east of Canyon, TX. Later, Louise decided to take on a career and went to business school in Amarillo and was soon hired on as the secretary of the Randall County Farm Bureau where she retired after 34 years of service. In 1971, Louise married retired Air Force Major R.L. (Tommy) Tompkins. They lived in Canyon, TX and enjoyed traveling to coin shows, square dancing and visiting their grandchildren. Louise was a member of Golden Spread Coin Club where she attended meetings and events with Tommy. She also held an office within the club. In addition, Louise was a member of St. Paul Lutheran Church in Canyon where she taught Sunday school. Louise was a hard worker who took great pride in providing for her family. She loved traveling to see her family. She also had a great sense of humor and was always up for a good laugh. She will be dearly missed by her family and friends. Memorial Donations may be made to Dreamland Cemetery 26500 S Hwy 87 Canyon, TX 79015 or St. Paul Lutheran Church 2600 4th Ave. Canyon, TX 79015.